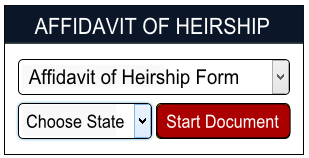 If you are wondering how to fill out an Affidavit of Heirship then feel free use our guide when filling out the form. It contains standardized information that you will encounter on nearly all Heirship Affidavits. An Affidavit of Heirship form is used to establish ownership of property when a person does not write a will or divide property through a Last Will and Testament. Fill out and print a free Affidavit of Heirship in just minutes online. Directions for filling out the Affidavit of Heirship are written in all caps and placed in brackets. 1. My name is [NAME OF AFFIANT], and I live at [PHYSICAL STREET ADDRESS OF AFFIANT]. I am personally familiar with the family and marital history of [NAME OF DECEDENT] and I have personal knowledge of the facts stated in this affidavit. 2. I knew Decedent from on or about [YEAR AFFIANT KNEW DECEDENT] until [LAST DATE OF KNOWING DECEDENT, USUALLY DATE OF DEATH]. Decedent died on [DATE OF DEATH OF DECEDENT]. Decedent’s place of death was [CITY, COUNTY AND STATE WHERE DECEDENT DIED]. At the time of Decedent’s death, Decedent’s residence was [ ADDRESS OF DECEDENT’S RESIDENCE]. 3. Decedent’s marital history was as follows: Decedent was married [NONE, ONE, TWO, ETC.] times. 10. Decedent died [ “WITH” OR “WITHOUT”] leaving a written will. 11. There has been [ “AN” OR “NO”] administration of Decedent’s estate. SUBSCRIBED AND SWORN TO before me on , 20___, by __________________________. Notary Public, State of ______________. Fill out a free Affidavit of Heirship in 5 minutes online.